In each of the string, the number of ‘b’ is one more than the twice of the number of ‘a’. As we want to design a NPDA, thus every time ‘a’ comes before ‘b’. We will push one ‘a’ into the stack for every ‘a’s and again for the next ‘a’, we will push one ‘a’ into the stack. And then when ‘b’ comes, for the first ‘b’ we will do nothing only state will change. For the next two ‘b’ we will pop one ‘a’ and again for next two ‘b’, we pop one ‘a’. And similarly we perform this alternatively. 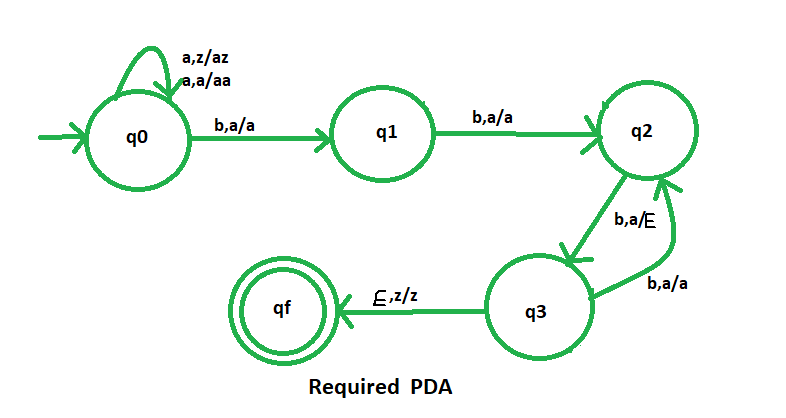 So, at the end if the stack becomes empty then we can say that the string is accepted by the PDA.